Personalized Christmas ornament, shipped fast! Makes a great Christmas Tree ornament, gift tag or wreath decoration. Personalized snowflake Christmas ornament, personalized and ready to adorn your Christmas tree upon receipt - great family gift idea! Our snowflake ornament is personalized to your specification, ready for you to attach a ribbon or ornament hanger and adorn your Christmas tree. 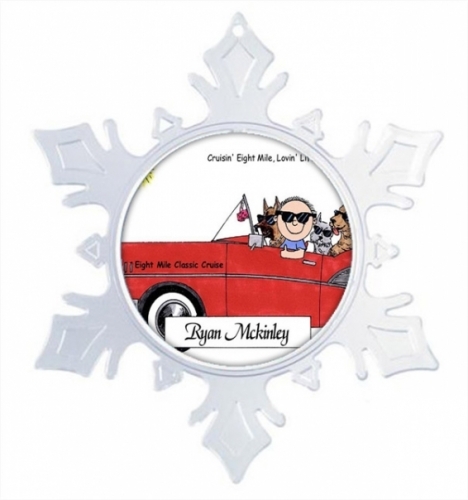 Your Friendly Folks cartoon, measuring approximately 3", is centered within our 5-1/2" acrylic snowflake ornament. This decorative ornament features crystal clear acrylic in the center, with frosted acrylic on the branches of the snowflake. Ribbon &/or ornament hanger not included, though our staff tries to sneak in a little piece of ribbon when available. Photos are for representative purposes only. Please note that, like our other products, our Christmas ornaments are created upon order, so your Friendly Folks scene may have white-space and/or be cropped slightly different than shown. This item is designed to be somewhat nostalgic in nature, representing a snapshot in time. Text in the background or far away from the main character in the scene may be reduced in size or cropped, (this is nothing to fret about, it actually looks good). Ornament will be single sided unless you specifically ask for both sides to be designed. No need to be nervous, we are professionals... Printed Perfection has offered our Friendly Folks caricature scenes for in excess of 15 years, and we are among the very few businesses that will accept returns and/or exchanges on our personalized gifts. We won't ship an item to you unless it's something we would like for ourselves.